Published on April 11, 2011 in Faith and Oregon. 5 Comments Tags: Betty Lou Holeman, family. 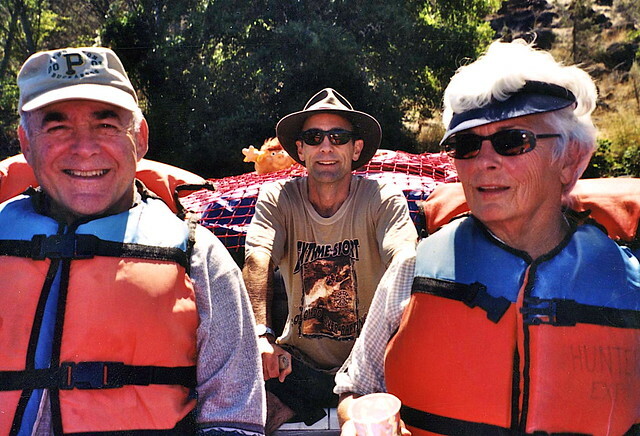 Grandma Betty, Granddad Emile, and my dad Mike raft the Deschutes River, from a set of family photos on Flickr. My grandmother Betty Lou Holeman died on April 2nd, 2011. She passed peacefully, surrounded by four generations of her family at St. Anthony’s Hospital in Pendleton Oregon, a few miles from where she was born. I wrote this requiem for her and for my own piece of mind. After reading it at a family gathering the night before her funeral, I decided to post it here for the rest of my family. I am the youngest son of Betty Lou’s oldest son, and as one of the grandchildren I am in many ways unprepared to speak about her life. We grandchildren rarely appreciate how our grandparents have changed over time. For so many of Betty Lou’s stories we simply were not around, and we struggle to see the accomplishments of a lifetime, what was tough and what came naturally when she was younger. Instead of countless stories that paint a trajectory of progress, we see a more fixed identity. To a young enough eye, grandma and grandpa’s role feels as dependable as heaven and earth and I am convinced that is why we kids put down our own roots there. When a stranger asks me about myself, I think of where I come from, and sometimes I think of Betty Lou. More frequently I call on a general sense of belonging that is an almost physical sensation, like the way I can choose to cover my arms with goosebumps if I concentrate. I tell stories about Christmas, Thanksgiving, going to the cabin, picking huckleberries, cooking and eating together, splitting firewood, hunting and fishing, training as an athlete and supporting the home team. I tell how parts of my family walked here before Oregon was an American state, and we have made do by any number of ordinary and honorable vocations since then. But the belonging doesn’t really come from the activities, as much as I value them. The belonging emanates from the people I do these things with, especially Betty Lou. She collected the family history to share with us and more importantly she also presides over it, she presides over our stories. She and Granddad are the quiet masters of ceremony for our whole family experience when we get together. Betty Lou has gone but she left that sense of belonging behind for us; this is the first way that she lives with us still. Feeling my roots is especially important for me when I am far from Oregon, and sometimes I feel like I am kept close to this family by forces greater than I understand. The night Betty Lou passed away I was working at a Catholic mission hospital called St Gabriel’s in rural Malawi, in eastern Africa. After dinner I sat around the table with seven new friends from medical schools in Kansas and Maryland, and someone suggested a game to play. According to my new friend’s rules we went in turns around the table; all the young men said the names of their grandmothers and the women said the names of their grandfathers. For each person the group chose one of the two names. For me they chose Betty Lou and all night long anyone who called me anything other than Betty Lou had to take a drink from their cup. Maybe you’ve never tried it, but it is actually hilarious to have near strangers call you only by your grandmother’s name, more so after a few drinks. I didn’t know Grandma’s health was taking a turn for the worse, but circumstances mainly beyond my control had decided that she would be on the minds of our entire family that Saturday night, and being ten thousand miles away with no news from home just was not going to stop me from taking part. I thought of her all night in a happy, chuckling way. When I awoke in the morning I saw an email from my mom that Grandma Betty’s blood pressure had dropped and she’d been taken to the hospital again. When my mom wrote that mail she hadn’t yet known how the night would end, but I just kind of knew when I read it. Due to the time difference I didn’t call my mom until 4pm, which was 7am Sunday back in Oregon. I was on the next flight home, five minutes after 3pm Monday. Thinking of Grandma Betty as the plane left the ground, wishing her soul a swift and beautiful journey as I made my own way up through the first wispy clouds. The plane continued to rise up over Lake Malawi, such an enormous stretch of water it is like an inland sea. Then far below I saw something unlike anything I had seen before, which is uncommon given how much I fly for work (I’ve filled eleven pages of my passport since August). Some trick of the sunlight on tiny rhythmic wave patterns below, perhaps wind and just the right altitude made a broad patch of the water begin to look like a great crowd, very far away, clapping its hands. With a muted smile I thought that perhaps God had heard me and responded by sending Grandma off to an extraordinary round of applause. But then I felt more strongly that she was close there with me, that perhaps it was Betty Lou down in the surface of the sea, clapping for me. Wishing me a safe journey home, typically quiet and proud without fail, this time because of how closely I carried her in my heart. As if to say If you are willing to live your life in view of eternity, Isaac, you’ll know my support whenever you need it. Growing up not going to Church, I would say this is the recourse nearest to prayer that my family taught me, and by this second means Grandma Betty will live with me as long as I carry her close. Hours later I am somewhere over the Atlantic as I type this. I’m looking forward to seeing my family, I know we’ll all be strong for each other’s sake. And whenever we rally together for our family’s needs or celebrations, we can say for a third reason that Betty Lou’s story continues and probably will continue on for an awfully long time.